My creativity seems to be taking a bit of a hiatus lately, as I haven't been in my studio in a few days. I've been catching up on things here around the house and just taking some "me" time. I'm looking forward to getting back into the studio this weekend and getting inky, my friend Sue is coming to visit and I've just ordered a bunch of products to get muse flowing! The Markered Rainbow Resist from the August Technique Junkie Newsletter is a great technique for adding color to Black and White Pattern Papers. I still have a stack of pattern papers left from my Stampin' Up! Demo days, and am glad to be able to use up some of the scraps with my card post for today. All stamps are from Stampers Anonymous (Natures Discover), the text is stamped in Black over the Blue wild flowers, the edges sponged with Ranger Gathered Twigs Distress Ink. The Butterflies are stamped in Black and colored with STAEDTLER Karat Aquarell Watercolor Markers. I also used the STAEDTLER Markers following the technique directions to created my coloring over the pattern paper. A bit of Zva Creative Crystals were added to embellish. Thanks for stopping by, I'll be back tomorrow with a Sketch for the Bloggers Challenge! Lovely atmospheric piece... I love that sentiment glowing with brightness! 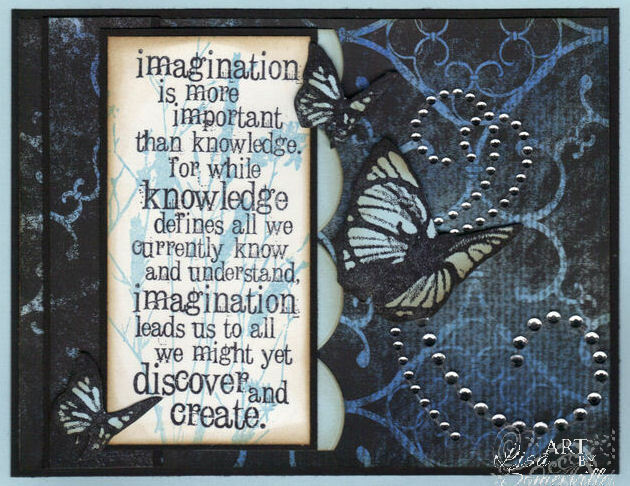 Gorgeous card, when you find your mojo maybe mine is hiding with it...can you send it my way? Love the zva crystals on here, looks like pressed metal into the paper. Beautiful card, Lisa. Love the motion you have going for the b'flies with the bling. In the darkness of night, comes this beautiful scene!